Introducing… A New Way to Feel Relief From Your Allergy and Asthma Symptoms… Guaranteed! There is now a revolutionary new anti-allergen carpet cleaning and treatment program called the ResponsibleCare®System that allows you to safely, easily and affordably reduce the levels of these serious allergens by 90% or more! 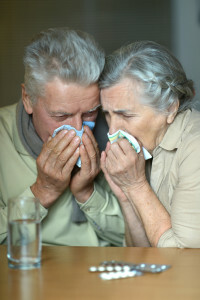 Let J&S provide relieving Anti-Allergen service for your home. J&S Steamway is proud to be Alaska’s full line distributor! You already know that successfully managing allergic illness consists of doing everything you can, from taking your medication to practicing good Environmental Control. The most important objective of Environmental Control is to minimize or avoid exposure to allergens from dust mites and pets, the most potent allergens found in indoor air. The ResponsibleCare System is a powerful new way to achieve this objective. The ResponsibleCare System includes specially formulated cleaning agents used prior to application of Allergy Relief Treatment on carpets, mattresses, upholstery, rugs and bedding. Allergy Relief Treatment is a hypoallergenic solution that contains a powerful active ingredient derived from naturally occurring extracts found in renewable fruit and vegetable seeds. Allergy Relief Treatment changes the shape of allergen proteins, making them unrecognizable to the body, which prevents them from causing an allergic reaction. While all allergens cannot be removed from our environments, we can remove their ability to cause a reaction in the body. For additional information about this tremendous product and cleaning system, please call us 907 349-0911.